Unlike erosion, which is the physical degradation of a material due to the flow of water, wind, or debris, corrosion is the degradation of a material caused by chemical reactions. Corrosion affects many types of piping metals that are used in our daily lives and in various industrial plants. Corrosion in pipes can advance into the interior parts of the metal over time, which may lead to pipe thinning and eventually pipe failure if left untreated. Furthermore, corrosion by-products are often carried downstream in piping, which can contaminate the fluid, cause the erosion and further corrosion of piping, and clog valve orifices. Steel piping, which is commonly used in steam systems, contains a significant amount of iron and is vulnerable to rust under certain conditions. Iron rust occurs due to the oxidation of the surface of the metal upon exposure to air and water. Steel condensate recovery pipe systems are especially vulnerable because the reagents for rust to form (oxygen, water, and iron) are abundant. Conversely, in well-maintained steam pipes, there is significantly less air after start-up and very little water, which slows the advancement of rust. Additionally, less rust will generally form in a closed condensate recovery system than in an open recovery system due to the decreased exposure to air in the former. However, the infiltration of air into the system upon shutdown can lead to significant corrosion if not properly drained. It is important to realize that systems with frequent shutdown periods may experience accelerated rusting in all pipes if condensate is allowed to remain in the system during shutdown time. A good measure for preventing rust during operation is to employ the proper use of steam traps which will remove condensate as it forms and help to keep the steam dry. Air should also be removed from the system via air vents so that opportunities for rust to form are minimized. When shutdowns occur, it is important to manually drain condensate from all collecting points which may not be drained automatically by steam traps. Copper is often utilized in tracing lines due to its low installation cost and ease of bending around equipment and flanges, but it is also vulnerable to corrosion under certain conditions. High temperatures and low pH values in condensate can cause copper to degrade into copper ions which then dissolve into the condensate. 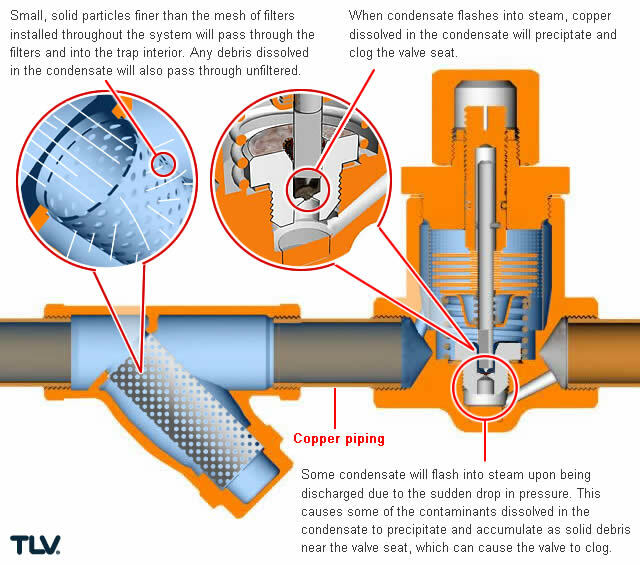 When copper-laden condensate reaches a steam trap and is discharged, the lower pressure on the outlet side of the trap will cause part of the condensate to flash into steam; some of the dissolved copper ions may precipitate and accumulate as solid build-up around the valve seat, causing orifice blockage and lowered temperatures in the tracing line. It is important to take extra precautions in treating water and pH monitoring to prevent this from occurring. Low dissolved oxygen content and a neutral pH of 7-9 are ideal. Ammonia is sometimes used in water treatment to combat low pH levels, but in copper, it can actually catalyze the corrosion process and should therefore be avoided where copper is used. Passivation refers to the formation of a thin layer of oxide on the surface of the metal upon contact with air. The oxide layer protects the metal, which retains its original color and luster. In the case of stainless steel, this layer forms naturally and is resistant to rust and other types of corrosion. Stainless steel can be used in industry for systems where resistance to corrosion, capability to handle high temperature, and high standards of sanitation are absolutely vital, such as in demanding heavy industry or medical applications. TLV employs the use of stainless steel in many of its steam traps and offers stainless steel options for many other products to meet these needs. Though stainless steel products may command a higher purchase price, it is also important to consider the remarkable longevity and durability they can provide. Many companies are now requiring stainless steel for tracing systems to avoid blockages caused by corrosion. 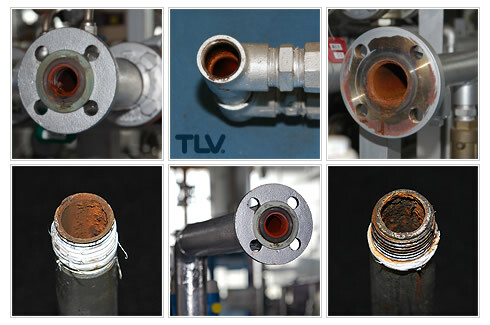 Apart from clogging steam traps and causing pipe thinning, corrosion can also affect other parts of the steam system. As corroded metal separates from the pipe wall and is carried away by the fluid, it may erode piping further down the line. Furthermore, the presence of metal solutes in recovered condensate decreases the water quality and can cause scale deposits to form in boilers as recovered water is boiled away, leaving the metal behind. The best way to combat corrosion is to prevent it as effectively as possible. The conditions that allow corrosion to occur can be controlled and corrosion reduced by the proper implementation of steam traps, air vents, and operational procedures – especially during shutdown - to prevent air and water from reacting. Proper water treatment and close monitoring of condensate pH levels are also critically important factors to help prevent corrosion. Lastly, it is crucial to take care in selecting piping and traps based on the specific conditions and needs for your system. In systems that regularly shutdown, regardless of how long the shutdown period typically lasts, condensate may remain in the system and mix with air, allowing for the advancement of corrosion. By completely draining the system of condensate at shutdown time, the progression of corrosion can be significantly reduced.